Average Weight	: 40 - 65 lbs. Ewenity Farm Border Collie Haven, Inc. Despite its name, the Australian Shepherd is not Australian at all, but was developed most likely in the Pyrenees Mountains between Spain and France, and refined in the U.S. to work as a herding dog on ranches. 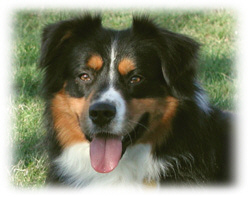 Many consider this breed to have really been developed in Western USA. The breed's principal forebears were most likely Spanish dogs that accompanied the Basque shepherds and herds of fine Merino sheep exported to both America and Australia in the early days of the colonies. At some point it probably crossed with Collie stock. This breed has had many names in the past including the Pastor Dog, Blue Heeler, Spanish Shepherd, Bob-Tail, New Mexican Shepherd and California Shepherd. Its many talents include retrieving, herding, watchdog, guarding, police work, narcotics detection, search & rescue, agility, competitive obedience and performing tricks. •	High Energy ~ require plenty of daily exercise [minimum 30 minutes/day ~ not just walking ~ get them involved in fun chasing, catching, running beside joggers, etc.]. •	Great competitor in dog sports, such as Frisbee, Obedience, Agility & Herding Trials. •	Happiest when they have a 'job' to do. •	Very intelligent, versatile, loving, loyal and fun. •	Average Shedders ~ not a 1st choice for those with dog hair allergies. Regular brushing will be required. •	Can be destructive if left alone for long periods and not receiving mental & physical exercises. •	Will bark to alert you of dangers. •	Do not do well relegated to back yard; need to be inside, part of the family. •	Loyal to their family, can be standoffish with strangers, until they get to know them. •	Can be good with kids if early socialization, but known to 'herd' and nip at children's heels, due to their 'herding' instincts. •	Get along with other pets, but need early socialization with household cats and smaller pets, until they learn that these pets aren't part of a 'flock' that needs herding.